FREE FIRST TIME BUYER EVENT! 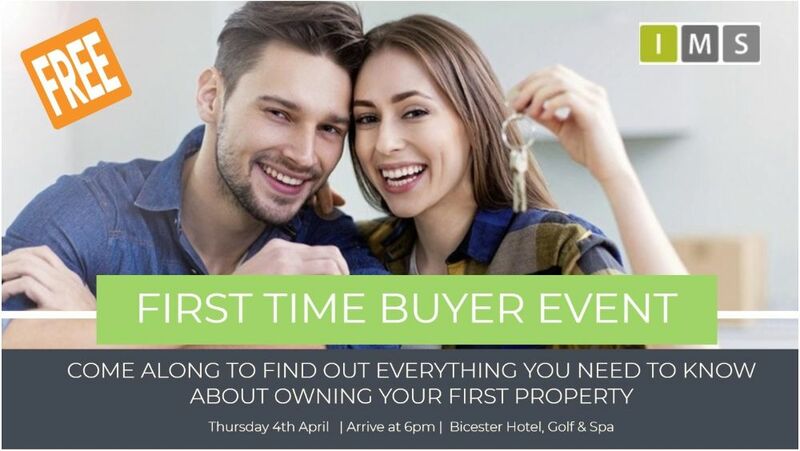 IMS are hosting a FREE First Time Buyer event at the Bicester Hotel, Golf & Spa on Thursday 4th April from 6pm until 8pm. Come along to find out everything you need to know about buying your first property. Join us and hear from leading property experts throughout the evening, including property developers, financial advisors, legal experts and mortgage consultants. Bromford: What they are and are they right for me? Dorchester Homes: Help to Buy Equity Loans: What they are and do I qualify for one? Heyford Regeneration: Social Housing. Affordable homes to rent and shared ownerships at Heyford Park. Spratt Endicott Solicitors: Legal aspects of the property industry. What’s can I expect from the property purchase/sale process. Graven Hill: Custom-built new home purchases through Help to Buy Equity Loans. Indepentent Mortgage Advisors: Get your FREE mortgage assessment, helping you to understand what mortgage can afford, what deposit you would require and what type of home you could potentially buy. You do not need to bring any paperwork or documents with you, but you will need to know your annual income, monthly expenses including loans, and if you’re buying a property with someone else you will need to know the same information for them. We now only have less than 50 tickets per session to give away! Please click below to receive your FREE tickets.